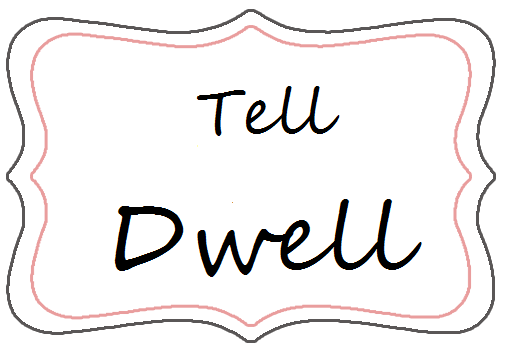 Dwell by Cheryl: "Tell Dwell: Volume 2"
Recently in my first ever Tell Dwell post, I asked readers to send me their design dilemmas. I received several and will attempt to answer a few here. This reader recently closed on her very first home and has been trying to figure out what to do about the built-ins surrounding the fireplace in her new living room. Reader: "The fireplace in the living room has built-in bookshelves on either side. We really like the bookshelves, but the whole wall is so brown and we have laminate flooring which is more brown. We've considered painting the bookshelves white, but that seems so extreme, plus we're not sure how white bookshelves would look next to the fireplace and if it doesn't look right it's a big fix! Any suggestions??" DBC: This one actually isn't so easy, mainly because there are so many right answers. For starters, I agree, it's too much brown. The lack of variation in color makes it very blah. 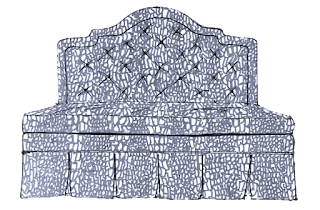 I think it would lighten the whole feel of the room. 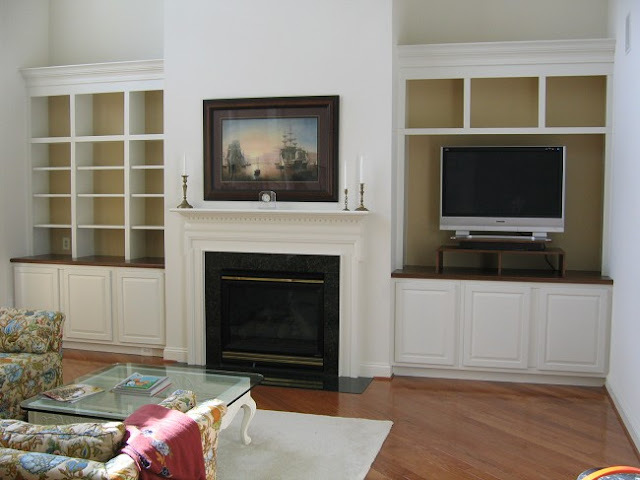 Like the example above, I would recommend leaving the cabinet tops unpainted and a complimentary color in the back of the built-in will add some depth. This option is a pretty safe one. It will solve the problem, but it won't give you anything to write home about. 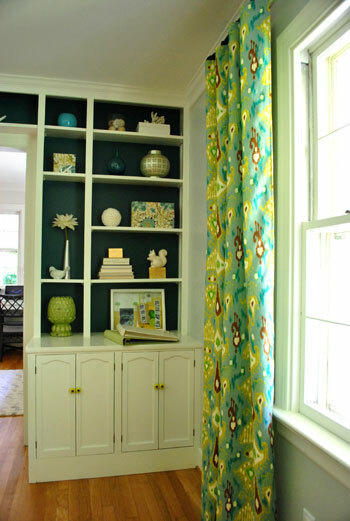 Painting the built-ins white and using the back panels as an accent will immediately make the cabinet pop. 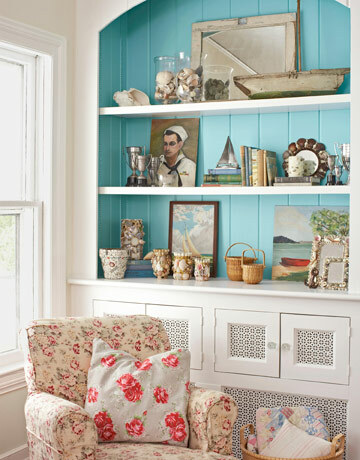 You can use the color to drive the direction of the room's decor. 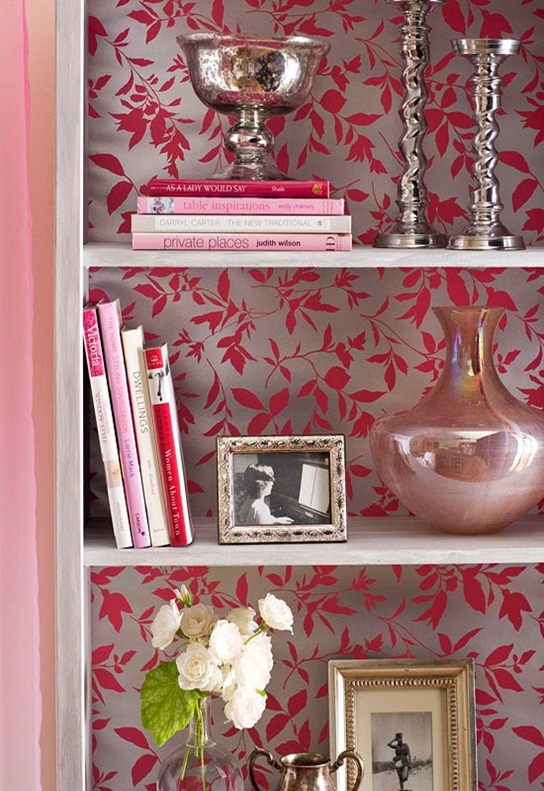 If you're like me, and have an obsession with wallpaper, these options are FAB! Hope this helps. Let us know what you decide and send us a picture. Do you have a decorating dilemma? 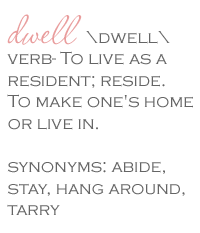 Tell Dwell. I'd love to hear from you on the site. Cheryl - Thanks so much for the suggestions! 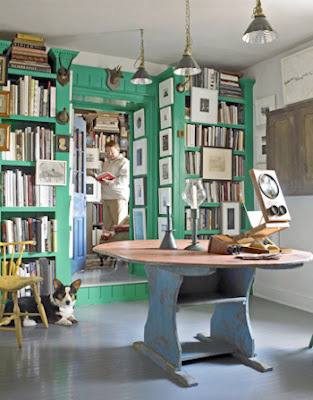 We love the idea of painting the back of the bookshelf a darker color to make the room look larger. I will send photo updates once we get up the nerve to actually paint! Also wanted to let you know that you've inspired me to check out the massive Goodwill near me and to make the trek to Garden Ridge in Greensboro...hoping for some good finds to decorate our new home. Awesome! Glad to help! Happy hunting!